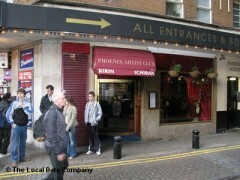 ..red gilded curtains, secluded booths and resounding cabaret..
About: Phoenix Artist Club boasts a bar and restaurant area. Once beloved by washed up soap stars, they’ve now decamped to do Daz adverts and left the Phoenix to the stars of the comedy world. PAPPED: David Mitchell, Simon Amstell and David Cross of Arrested Development. This place is vital and if you’re really serious about the business of show you should be in its basement right now swigging wine to the sound of Maurice the manager’s Never-Ending Show Tunes Playlist (just make sure you get in before the eight o’clock members only cut off). "..red gilded curtains, secluded booths and resounding cabaret.."
If show tunes and spotting actors on their day off is your thing then bring that thing to the Phoenix, where actors can be bothered to the sounds of Les Mis playing in the background. Below the Phoenix Theatre is the bar, or more precisely the lounge, in which to gain entrance you’ll have to prove membership, turn up before 8 o’clock or just sneak by. Maurice is the man who’s been looking after this garish paradise for years and more often than not you’ll find him circling the bar in a place that’s seems to be so seductive because familiarity breeds content-ment (I think that’s the phrase). No matter when you show up it’s always the same and whether it was years ago or last week the heavy red gilded curtains, the secluded booths and the resounding cabaret of it all is still original. The walls are filled with the actors of the stage and even a cynic will find a bit of the romance about it and while it does have its fair share of couples it gets loud and bouncy as well. To keep up with the kitsch there are hot sausages on sticks at the bar alongside a few good beers, but this isn’t really a place to come for the drinks where it’s more about finding late-night mischief.